£252 Full Price; £189 Concessions. From concept to a completed script – New Screenwriters Workshop will guide you every step of the way. The New Screenwriters Workshop is a bespoke discussion-based follow-up to the Introduction to Screenwriting Course in which individual attention is given to developing each participant’s project from concept to finished script. The course itself will span 8 sessions, culminating in an individual tutorial in week 8. Students will be expected to have internet access, meet deadlines and set aside some time each week to read other student’s work. Students can choose the projects they want to develop but should be aware of the limitations of the course, and the need to read other students’ drafts each week. It helps to focus on a project that is do-able; something you can complete in 8 weeks. This might be a short film, several scenes, or one act of a feature-length screenplay. Why do New Screenwriters Workshop? * To put theory into practice. * Work collaboratively with other creative people instead of in isolation. * Have your ideas critiqued and developed. * Help others in turn with your feedback and comments. * Learn the techniques and pitfalls of screenwriting. * The script for a short can be entered into screenwriting competitions or could be made into a film with only a modest outlay. Who is the New Screenwriters Workshop aimed at? * Those who want to take the next step following the introductory course. * Students of film-making and media studies. * People with some experience of film-making who want to hone their narrative skills. * Creative writers and novelists who want to turn their stories into film. Those wanting to do the Workshop should have completed Film Oxford’s Introduction to Screenwriting weekend course. When booking please include the approximate date you did the Introduction to Screenwriting course. (We sometimes make exceptions for people who have already done an introductory course elsewhere – please email us with details if this is the case). As students will be reading and commenting on each other’s work, you should have English as your first language or be very fluent in spoken and written English. Polly, along with David Spencer set up the weekly Oxford Screenwriters group in 2010; it became part of Film Oxford in 2013. The group runs workshops on all aspects of a screenplay: concept, structure, characters, plot, dialogue, etc. One script about the Isle of White Festival is with an agent in London; a number of short films have been produced, one winning an award, and a number are in an advanced stage of development. Polly’s background is in TV and documentary editing. She took a degree in Film & Television at the London College of Communication, (part of the University of the Arts, London). Her graduation film won Best Student Film award and was distributed internationally by the Arts Council. She subsequently worked abroad in corporate communications both as a camera operator and editor, she moved on to edit a film for the South Australian Arts Festival. Back in London, Polly worked in editing for over 10 years, progressing from assistant to documentary editor. Her credits include several well-regarded TV strands: 40 Minutes, Timewatch, Horizon, and Arena. In Oxford, Polly helped set up the Oxford Channel where she was a producer and trainer. She was responsible for training interns to produce short documentaries, broadcast on a weekly turnaround basis. She has also run arts projects and courses in media and film and worked at Bullingdon Prison for a number of years working on different arts projects ranging from stand up comedy workshops to opera in the prison. In 2013, Polly’s screenplay ‘Love & Shame’ was workshopped by film producer and theatre director Victor Glynn. She is currently developing a screenplay, ‘The Art Thief’, based on a true story. Next dates TBC (There will be gaps between sessions for writing and holiday times; see below for content of each session). Email us to express an interest. All dates are Sunday evenings 6.15pm-8.15pm, except the final session, (1-2-1 slots) which happens Sunday daytime, by arrangement. £189 – Discount for NUS Students and people on following means-tested benefits, proof required: ESA (income related); Income Support; Working Tax Credit (not child tax credit); Council Tax Benefit (not student/single person/reduction due to disability); Housing Benefit; Pension Credit (guarantee); Unwaged Dependent of these benefits. All students will bring with them a list of 5 premises, one paragraph on each idea. These will be discussed by a group until each person has chosen 2 solid ideas. Homework: A half-page outline for 2 selected ideas. The group will discuss each others’ outlines and help decide which will be selected for development and how they can be improved. Homework: Write a final one-page outline of 1 chosen idea. We will discuss the best ways of bringing these ideas to life and how best to plot a script. Homework: Write a full treatment for the script idea, detailing full narrative structure. How successful are the proposed narratives? How well placed and how effective can they be? What issues arise? Characterization: How to create believable and sympathetic characters. Homework: Write half the screenplay. Issues of tone and writing style and any worries or questions students might have to be addressed. Homework: Write second half of the screenplay. What went right, what went wrong? How can it be sorted out? Homework: Write the second draft of the script. 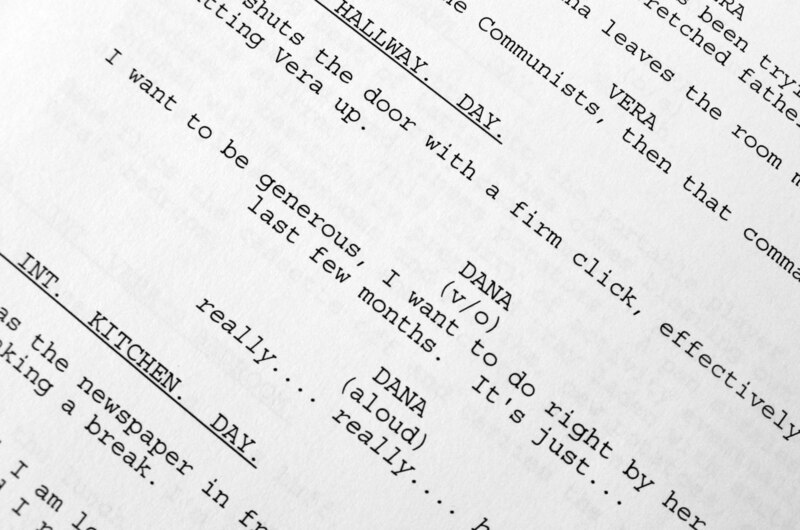 Two actors will conduct a read-through of dialogue scenes from the second draft script. This will highlight successes and problems. Homework: Write final draft of the script which will be marked by the tutor. Half hour one-to-one sessions with the tutor to discuss the scripts, the reports or any aspect of screenwriting or future careers the student wishes. (Note: Sunday daytime, your particular slot by arrangement). Film Oxford can provide a pathway from original idea to completed film. In screenwriting, beginners start with the Introductory Weekend, then move on to the New Screenwriters Workshop. More advanced writers may be able to join the weekly Screenwriting Group.